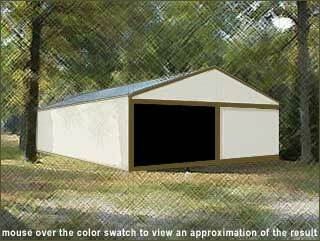 Erected buildings may be viewed before purchase at our convenient Marion, Illinois facility. Delivery is available on all sizes, or buildings through 30' may be picked up on a 16' utility trailer. Our buildings are all-purpose, variable use post-frame metal buildings that can be used for any activity that requires a structure. We have a variety of sizes and designs from which to choose that range in widths from 20' through 80' with unlimited length. All buildings have 4/12 pitch, clear span trusses that are placed on 6x6 treated posts set 10' on center, with 2x4 perlins and girts 24" on center. Above is an overview of interior construction with lighted ridge cap shown. Displayed colors may be altered by monitor settings.